« Brown Bag Oct. 31 Dr. Kendra Brewster! 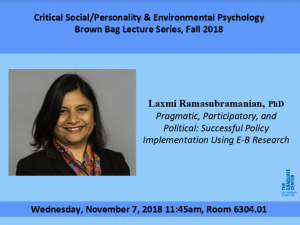 To learn more about Professor Ramasubramanian’s lecture, click here! Dr. Laxmi Ramasubramanian, Architect and City Planner, will be holding a Brown Bag Lecture Nov. 7th! This lecture is free and open to the public! Professor Ramasubramanian is an Associate Professor of Urban Planning and Policy at Hunter College and Deputy Director at the Institute for Sustainable Cities at Hunter College. She holds undergraduate and master’s degrees in Architecture from the University of Madras, India, a master’s degree in city planning from the Massachusetts Institute of Technology and a Ph.D. in Architecture from the University of Wisconsin-Milwaukee. She is also a certified planner holding the AICP credential.